Welcome back! We already had our first iPad PD session yesterday morning. Last year our theme was “The Building Blocks of Learning“. This year, we are going to take what we learned individually and pay it forward. Here are the slides, for your perusal, though the session was very interactive so they are pretty minimal. I divided the session into three parts. Part I: What do you want to learn? How can you be a resource? I divided the tasks loosely into the following categories: Content Creation, Accessibility, Assessment, Collaboration and Other. 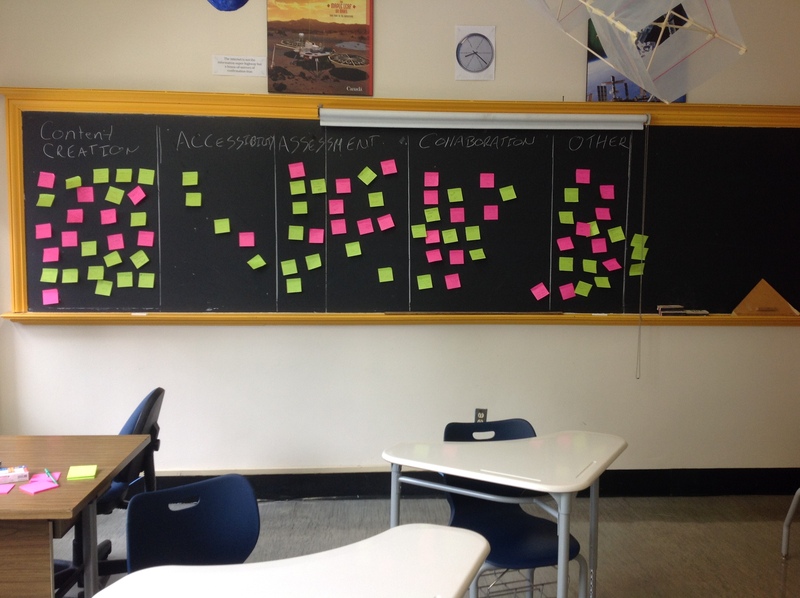 I was gratified to see that the green and pink post-its were pretty balanced! Presentation must be very brief (under 15 minutes), which would allow at least 40 minutes for play. Stick to one concept and only concept. the equipment/apps they will need. if possible, a quick introductory/explainer video of what they will be talking about. I am excited to announce a busy PD session tomorrow! I know, I know. I can hear your groans from here. But no! It will be fun! I promise! You will need to create an Adobe ID if you don’t already have one. This is the ID you use to sign in to any of Adobe’s products. Give yourself a minute to figure this out. Please make sure you have the Socrative student app as well. This is different from the Teacher version. Once again it is free! BEFORE OUR SESSION YOU WILL NEED TO: (this will take you about five minutes. I swear). 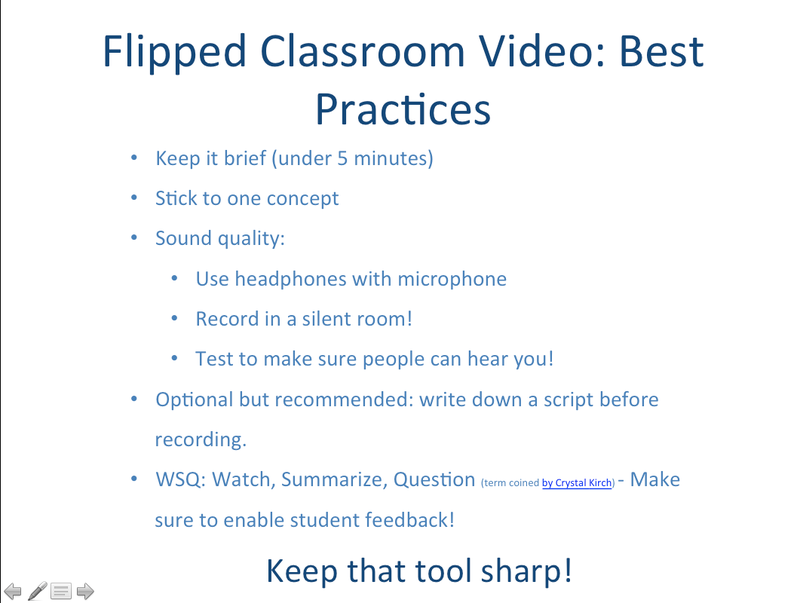 About 3/4 of the staff actually watched the video beforehand and filled in the Socrative quiz, which was a great way to see who watched the video.I also included my finished version of my Adobe Voice movie on Email Etiquette. The feedback was interesting. I was not expecting the teachers to try the app as they went through my video- it was meant only as a quick introduction to the app so that we could try it together in the iPad session. Also, one teacher told me that she had to pause and rewind several times as my screens did not match what she was seeing. As well, I didn’t use a script so it is a little choppy and, admittedly, it was kind of weird to use a whiteboard app (Explain Everything) to demonstrate a storytelling app. But I thought using Adobe voice to demonstrate Adobe Voice was just way too meta for me. However, none of that really mattered. Those who felt like they had enough information to go try it on their own found a quiet place to work on their story. Those who felt like they needed a little more support stayed in class and we went through it step by step with me. I had scheduled about 40 minutes for this activity – we went a little over, but not much. We even had time to share some of the teachers’ stories! Although we had a little less time for this (I wanted a half hour, but we had twenty minutes left), the feedback from the teachers was very intriguing. They commented on how distracting it was to see the teacher in the videos, or weird verbal/physical tics, and recognized that they themselves have those kind of tics and how important it is to be aware of when you are recording yourself. In some videos the sound quality was not up to par. In others, they really liked how the teacher zoomed in to emphasize certain areas of their subject. All in all, it was a full but productive morning and I can’t wait to see what the teachers teach us this year! For those of you who missed the presentation yesterday, here are the slides! Have a great summer and don’t forget to reflect on your personal tech goals for next year! While I was following up on our Staff personal tech goals last week, I realized that I completely forgot to make my own for this last year. Well, I think it might be time to put my money where my mouth is and actually make my own goals for this coming year. Please take the time during the summer to think about what you would like to accomplish in terms of integrating technology in your classroom next year! They don’t need to be huge goals – in fact the smaller, more specific, the better! Don’t bite off more than you can chew! So here I go, trying to take my own advice. RETHINKING IPADYOUPAD: I am feeling uninspired with this blog. I would like to post more original content, but that takes time. I think next year I will limit my posts to once a week but take the time to explore either an app or a concept in more depth. MORE FOLLOW-UP WITH PD: I am great at implementing ideas and strategies but I feel like I stumble with my follow through. I would like to have a simple PD plan that involves individual tech goals and where I will check-in after a certain period to see how it is going. These check-in times will be integrated into our Tech PD curriculum. These topics will be either integrated into relevant topics already in the curriculum, or be stand alone sessions or be led by guest speakers/facilitators. They should happen at least once a term. That’s all I can think of right now. I am sure as the summer wears on I will think of more!